Om Sri Sadguru Devaya Charanom Sharanam Prapadhyanay!! Kindly lead us from falsehood to truth, from darkness to light, and from mortality to immortality! My heartfelt gratitude to you for all your love and care!! Seeds of disappointment cannot take roots in a heart full of gratitude. A grateful heart is a peaceful heart, because it tries to find a reason to thank Baba in every situation. In other words, an attitude of gratefulness keeps one positive under all circumstances. When Gurdjieff was just a child of nine, his dying father said to him, "I cannot give you anything except the one deep thing that I have experienced in my life. There is only one thing that I have gained that I can give you as my heritage: whenever someone is angry at you, don't react immediately. Wait for twenty-four hours and then reply." Later on Gurdjieff was to say that this simple teaching transformed his whole life -- he promised his dying father that this rule would be binding on him for his whole life. If someone insulted him, scolded him, or abused him, he would remain a witness to it with no immediate reaction -- and not only outwardly but inwardly also. He would listen patiently to whatever was being said or done to him and then say, "I cannot react immediately. I will come back after twenty-four hours. This is a promise that I have given to my father. So I will come back after twenty-four hours and then I will react." Obviously, he never reacted. He found himself coming back after twenty-four hours and saying, "At the moment I could not react because of my promise. Now, too, I cannot react." His whole life was changed by it, because the opening for the lower became closed. Twenty-four hours is too long a period to wait. The mind opens only when there is a certain pressure -- and then only for a moment. If you wait, the mind will close again. If you don't allow the pressure to affect you, then after twenty-four hours the situation will have become cold and dead. Only in a heated moment is the mind ready to react. One must live a life of action, not reaction. You Will Only turn to Dust! What does God not have? What does He need? One must take a polished heart to God so that He can see Himself in it. "God does not look at your forms or at your deeds, but He looks at your hearts." Pain is a part of being alive. Pain refines our spirit just as fire purifies gold. It is integral to the process of our transition from a state of just 'being' into our 'becoming'. A caterpillar struggles painfully to break the cocoon that encases it in order to emerge as a beautiful butterfly. In a similar way, the human spirit undergoes the throes of suffering that, in fact, has the potential to evolve it into a higher spiritual state. Blessed are those who regard pain as a trainer that can transform the soul. Thus, instead of complaining, they stay grateful to it for its purifying and uplifting potential. Difficulties are tests from Baba. Tests of our character, endurance and faith. We may wander in the wilderness for long, but the promised land waits only for those who can remember that a difficult time is just a test. Like a potter on the wheel, Baba molds us, shapes us, and builds our character. Putting us through a bad experience or time is His way of refining us. A test well qualified brings us higher up, closer to Him. So, when in a difficult spot, let good attitude shine and impress the Master. The suffering may be intense, pain unbearable, and the heart may be cracking under existential pressures. But remember: It is just a test. A great opportunity to win the Master's heart. So, put on a smile on your face and spring in your footsteps when you feel that your world is falling off at the bottom [ ] Because, it is just a test. B E U T I F U L Threads.....Each word has poured out of my dearest sister Sunita's heart. Baba is everywhere, in everyone and everything. If divinity is so pervasive, any thinking person may ask, why do we have killers, rapists or dacoits in this world. In other words, if God is present in everyone, there should be no blood-shed, torture and other sorts of inhumanity around us. We may find some solace in explaining such evil things by karmic theory. That is, one gets what one sows. But by accepting this theory, we still do not deny the existence of an imperfect world. Ramakrishna Paramhamsa, one perfect Master of our age, once told his disciples that they should respect everyone, every living and non-living thing, because God exists in all. After getting this lesson from the Master, the disciples started respecting everybody they came across. One fine day, a disciple was on his way to the market. He was happily walking on the road, right in the middle. A man riding an elephant was coming on the opposite side. People dispersed to make the way for the elephant. But, this disciple folded his hands and continued walking in the middle. The man riding the animal shouted at him repeatedly, asking him to get out of the way of the elephant. The disciple did not pay any heed. He continued marching with full confidence towrds the animal. Now, it is not hard to guess what must have happened!! The injured disciple was carried back to the Ashram. The Master asked him gently as to how the accident took place. The disciple cried out loud, and started blaming the Guru, "You told us that God is in everyone and everything. I thought God was in that elaphant also, so kept walking towards it. You were wrong Gurudev? Look at my condition now". The Guru smiled, held his hand and said, "Why did you ignore the warnings of the man who was riding the animal? God was in him too". This story came to my mind this morning when one of my posts annoyed some devotees on this forum. One of them cited in bold letters from Sai Satcharita about 'divinity' being in all. Yes, I agree with her. Divinity is everywhere. But, that includes me too!! Baba, kindly make your devotees more tolerant to counter-views!! May they learn that faith need not be blind to other perspectives!! I agree with what you say.God is in you too.I hv read many of your posts and would love to continue reading them.You speak your heart and mind ,many people just follow like a herd without using their own wisdom and thought. In some situations, the story of Gautama buddha should be applied.Do not take hurtful remarks personally .Those also are someones opinions.they donot reflect you bt they reflect the inside of those who say harsh words.at the same time,just continue expressing ur thoughts the way u have been doing,as people like me visit this forum as we get more convinced by lifes experiences,and words written from heart and soul rather than being one of those who are doing hours of prayers in front of god bt being disrespectful to each other as human beings. Thank you for your kind words. I was a bit upset yesterday, but now I am fine. Baba used me to convey something to those He cares about truely. In that sense, I'm fortunate that I could be of some use to the Master. I'll keep posting irrespective of what some of the devotees may feel. My posts are my humble offerings to the Master that we all happen to have in common. Nobody really can take away my right to serve my Baba. I appreciate your courage to intervene in a neutral way in that post. Silence is not always beneficial. By speaking out, you gave me hope that all is not lost after all. Kindly keep up the task of intervening in conflicts, because avoiding that makes one a party to the injustice or unfairness. I am happy that I gained a genuine sister like you through this unpleasant experience. May Baba bless you always! OMSAIRAM!Sunita Dear,I am sorry for upsetting you. BABA alone knows how I felt. Please keep posting as you are an active memberof this online Mandir. Veena Maa is our Mother. How can a child hear anything negative about her mother. I can understand your concern for all of us. 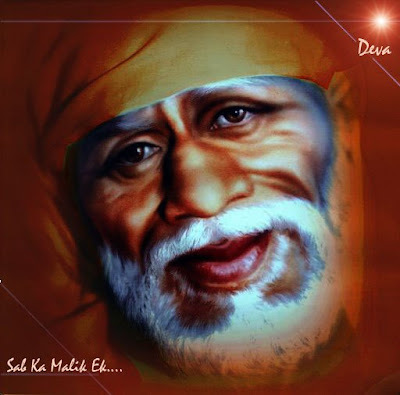 Sai baba shower his choicest blessings on you dear. Let us put it behind us. I respect you, and have no hard feelings against anyone. Thanks for your mail and blessings! May Baba shower His love and blessings on you always dear sister!! Dear Sunita ji and Dipika ji, Sai Ram ! A very happy day for me too after seeing your two posts as above. Throughout the day I was praying Baba since I was a little..... . Both of you are my dear sisters. I am very very happy. Thanks to both of you. BABA PLS MAKE OUR LOVE AND DEVOTION STRONGER AND STRONGER. Page created in 0.462 seconds with 69 queries.